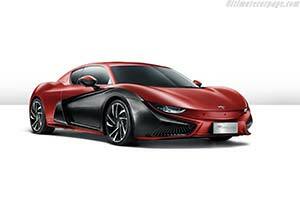 The Qiantu K50 by Mullen project exemplify the vision and further prove what Mullen Automotive can do as a company. Partner Qiantu and everyone at Mullen is working hard in providing an exciting product in North America. Here are some features that shows how good of a product the K50 is. Leather and Alcantara Materials Sports Seats: The sports seats are made of leather and Alcantara; the Alcantara's sleek design provides sufficient friction between the occupant and the seat while providing extra lateral support. The leather/Alcantara feels soft and is equipped with practical functions such as seat ventilation and heating. Brembo High-performance Braking System: Qiantu K50's Brembo 4-piston brake caliper guarantees a powerful braking force that allows the car to brake in extreme distances. The front and rear high-carbon ventilated brake discs are also from Brembo; these have a scribing and perforation design for better abrasion performance and thermal conductivity.